IXXAT offers a universal bridge, gateway, and PC interface solution for the wireless networking of CAN components and systems in a new and improved version. With three modes provided, the user can now adapt data communications to the specific application in terms of latency, data throughput, and fault tolerance. In SHORTEST_LATENCY mode, latency times averaging 4 ms can be achieved, while QUICKEST_CONNECTION mode permits secure data transmission even in CAN systems running at 1 MBit/sec and 100% bus load. A typical application for CANblue II is the wireless connection of CAN segments via Bluetooth and wireless system access using a notebook or handheld service unit. 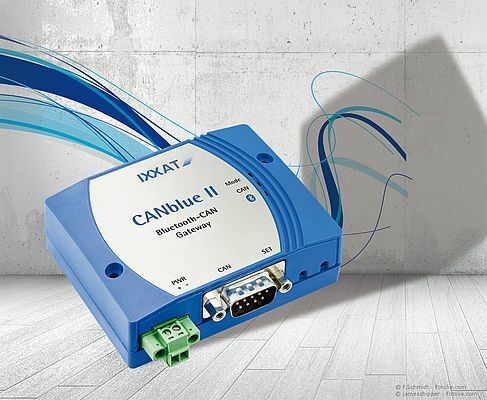 However, areas where an extremely reliable connection is required, such as the networking of rotating or mobile system parts, can also be implemented using CANblue II. Thanks to the use Bluetooth technology, built from the ground up on encrypted transmission mechanisms that are resistant to external interference, CANblue II is suitable for this kind of application. Bluetooth's FHSS process, also used in CANblue II, changes the frequency at which messages are transmitted about 1600 times a second. If one of the 79 channels used experiences interference, this fault is detected and the message is resent in another frequency range. The available bandwidth thereby is used very sparingly, so that multiple different Bluetooth systems can work in parallel without noticeably interfering with one another. The problems caused by overlapping WLAN systems and the limited number of WLAN channels, also considering the required channel spacing, is nearly unknown in Bluetooth. Even WLAN systems overlapping with Bluetooth in the immediate vicinity only interfere with the operation of the Bluetooth network to a negligible extent, since only a few of the 79 Bluetooth channels overlap the WLAN frequency band. Thus at most the transmission performance of an overlapping system, whether WLAN or Bluetooth, may be reduced due to the message retransmissions required. Used as a bridge, CANblue II units transmit their data transparently over the secure Bluetooth connection. In addition to pure CAN applications, this permits applications to be implemented using higher protocols (CANopen, DeviceNet, SAE J1939) and customer-specific protocols. For use on the PC a powerful Windows driver is available. Applications based on other operating systems (e.g. Android, Linux, INtime, QNX) or customer-specific hardware can be implemented using an open ASCII protocol. There is also an Android sample implementation available. Its broad power supply voltage range of 9 to 30 VDC, compact construction, and fastening holes in the housing all simplify the integration of the device into existing systems. The CAN interface is implemented in compliance with ISO 11898-2 and has a DSub 9 connector that meets the requirements of CiA 303-1. Upon request, the CANblue II can also be provided in an IP67 variant. The CANblue II is available with an internal or external screw-on antenna that supports transmission distances of up to 300 meters, depending on spatial conditions. The radio signal quality can be read out using Bluetooth to monitor the connection quality.